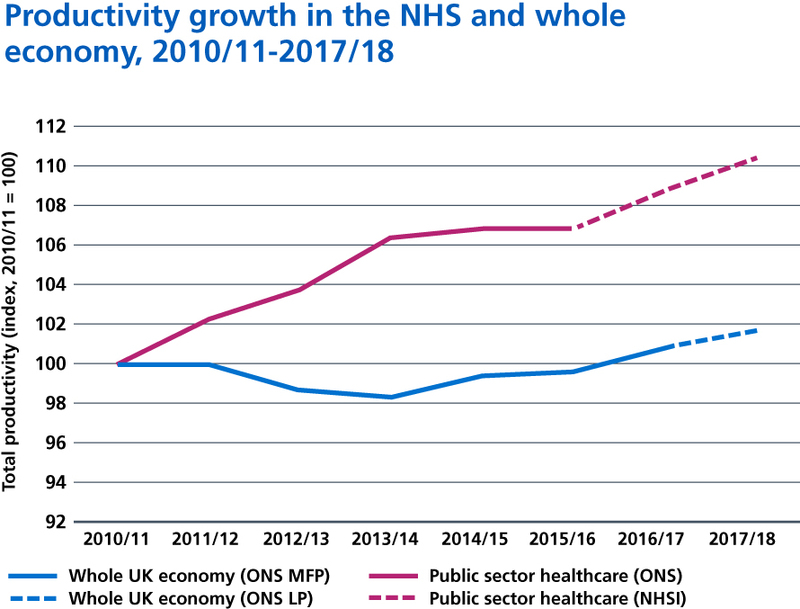 Sources: ONS Multi-factor productivity, UK (experimental); ONS Labour productivity, UK; ONS English public services healthcare productivity; Unpublished NHS Improvement estimate of English NHS provider sector productivity. 6.14. The government has set the NHS an objective of making re-investable efficiency and productivity gains of at least 1.1% a year over the next five years. Because we have an agreed NHS revenue funding settlement, all these gains can be retained by the NHS and reinvested in more and better patient care. This section summarises some of the steps we will take to deliver these improvements for patients, in the short, medium and long-term. 6.15. Despite the overall efficiency of the NHS, there is still waste and an opportunity to improve efficiency. A recent survey of leaders of NHS trusts and foundation trusts found that a majority agreed that opportunities still exist for greater efficiency even in their own organisation. Source: NHS Providers: Making the most of the money. Efficiency and the long-term plan. October 2018. Source: British Medical Association survey. Doctors’ views on working in the NHS. November 2018. 6.16. We have worked with staff across the NHS to identify opportunities to deliver more effective patient care. Our approach is to deliver clinically-led improvement and put the patient in the heart of the system. We deliver this through an approach called Getting It Right First Time (GIRFT). GIRFT will combine with other clinically-led programmes such as NHS RightCare and an increased investment in Quality Improvement (QI) to accelerate work to end unjustified clinical practice variation. Improving the availability and deployment of the clinical workforce to ensure the right clinicians are available to patients at all times, further reducing bank and agency costs. By 2021, all clinical staff working in the NHS will be deployed using an electronic roster or e-job plan. By 2023, all providers will be able to use evidence-based approaches to determine how many staff they need on wards and in other care settings. This will provide staff with opportunities for flexible working while helping reduce unwarranted variation and improve safety. Procurement savings by aggregation of volumes and standardising. The NHS spends nearly £6 billion a year on hospital consumables, including syringes and gloves, and common goods. We have introduced a new centralised NHS procurement organisation, Supply Chain Coordination Limited (SCCL), to help use this purchasing power on a national scale to get the best deals and deliver high quality affordable care for patients. By 2022, we will double the volume of products bought through SCCL to 80%, extend the number of nationally contracted products and consolidate the way local and regional procurement teams operate. Over 1.5 billion diagnostic tests are undertaken every year and feature in four in every five patient pathways. Capacity in diagnostic services has not kept pace with the growth in demand. We have fewer MRI and CT scanners per capita than most OECD countries , for example, while vacancy rates are 12.5% for radiologists and 15% for radiographers . Yet, the number of patients referred for diagnostic tests has risen by over 25% over the last five years. So delivering an effective, high-quality service requires investment in new equipment and staff, underpinned by a new model of diagnostic provision. Delivering pathology and imaging networks to improve the accuracy and turnaround times on tests and scans will make best use of the expanding workforce, and reduce unit costs. In 2018, seven Genomic Laboratory Hubs were established with mobilisation towards consolidated provision. By 2021, all pathology services across England will be part of a pathology network and, by 2023, we will have introduced new diagnostic imaging networks. The pathology networks will mean quicker test turnaround times, improved access to more complex tests at a lower overall cost and better career opportunities for healthcare scientists and clinicians. The investment in a new digital diagnostic imaging service will enable clinical images from care settings close to the patient to be rapidly transferred to the relevant specialist clinician to interpret regardless of geography. This infrastructure will enable the rapid adoption of new assistive technologies to improve and speed up image reporting, as well as the development of large clinical data banks to fuel research and innovation. The NHS will improve efficiency in community health services, mental health and primary care, which together cost around £27 billion a year. This Long Term Plan sets out the new investment we will make to improve these services. We will also support staff to increase the amount of time they can spend with patients to reduce the unacceptable variation as, for example, documented in Lord Carter’s review of community services. To enable this, over the next three years, we want all staff working in the community to have access to mobile devices and digital services as set out in Chapter Five. Ambulance services will be able to reduce avoidable conveyance to A&E by accessing patients records, alternative services and have the right clinical support and training. We will also ensure primary care networks can be most effective by introducing extended roles such as physiotherapists, clinical pharmacists and pharmacy technicians as set out in Chapter One. The GIRFT programme has already started work in mental health and will be extended across to community health services and primary care from April 2019. 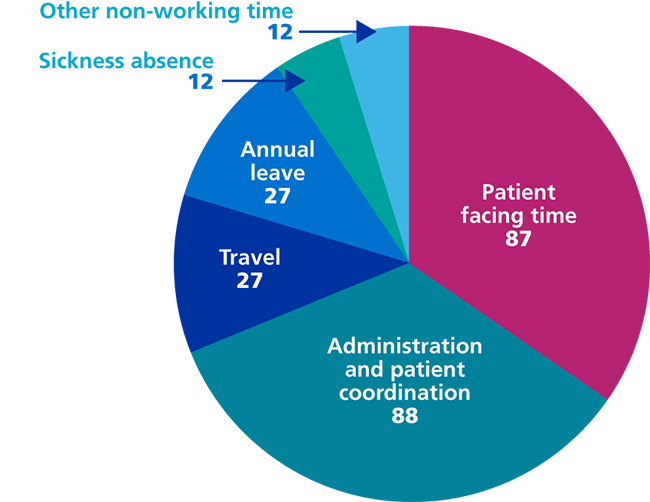 Figure 27: Average number of days per working year spent on different activities by a frontline healthcare professional delivering services in the community. Source: Lord Carter’s review into unwarranted variations in mental health and community health services. NHS Improvement 2018. Delivering value from the £16 billion we spend on medicines. Over the next five years, all providers will be expected to implement electronic prescribing systems to reduce errors by up to 30%. Up to 10% of hospital admissions in the elderly population are medicines-related, so pharmacists will routinely work in general practice helping to relieve pressure on GPs and supporting care homes. Research shows as many as 50% of patients do not take their medicines as intended and pharmacists will support patients to take their medicines to get the best from them, reduce waste and promote self-care. We will reduce the prescribing of low clinical value medicines and items which are readily available over the counter to save over £200 million a year. This aim is supported by agreed measures to manage branded health service medicines through the new statutory and voluntary pricing and access schemes. The new voluntary scheme has been agreed between industry, DHSC and NHS England, and is intended to ensure access to innovative new medicines coupled with affordability. We will use digital technology to ensure that best practice is followed, generics are used where possible and duplication is eliminated. Augmented intelligence to analyse data on medicines prescribing will also help us to eliminate fraud. Making further efficiencies in NHS administrative costs across providers and commissioners, both nationally and locally. This will save over £700 million by 2023/24, comprising £290 million from commissioners and over £400 million from providers. We will ensure that an increasing share of the NHS budget is invested in frontline services by simplifying costly and overly bureaucratic contracting processes, supported by reforms to the payment system as we progressively move away from episode-based payments. We will require commissioners and providers to continue to redesign and reduce the costs of transactional services. All core transactional services, such as processing invoice payments, will be automated over the next five years. The NHS will improve the way it uses its land, buildings and equipment. This will mean we improve quality and productivity, energy efficiency and dispose of unnecessary land to enable reinvestment while supporting the government’s target to build new homes for NHS staff. We will work with all providers to reduce the amount of non-clinical space by a further 5%, freeing up over one million square metres of space for clinical or other activity. By 2020, we aim to reduce the NHS’ carbon footprint by a third from 2007 levels including by improving energy efficiency through widespread implementation of LED lighting and smart energy management. We will also improve the way we manage our estate and modernise and standardise our ambulance fleet to help to reduce emissions and to improve air quality (see the Appendix). Research evidence shows some interventions are not clinically effective or only effective when they are performed in specific circumstances. And as medical science advances, some interventions are superseded by those that are less invasive or more effective. The NHS needs to ensure that the least effective interventions are not routinely performed, or only performed in more clearly defined circumstances. This summer, the Academy of Medical Royal Colleges, NICE, NHS Clinical Commissioners, NHS England and NHS Improvement joined forces to consult on how best to reduce inappropriate interventions. This will potentially avoid needless harm to patients, and free up scarce professional time for performing other interventions – including creating headroom for proven innovations. The time and resources saved will all be reinvested in patient care. Improving patient safety will reduce patient harm and the substantial costs associated with it through a new ten-year national strategy, to be published in 2019. We aim to be the best healthcare system in the world at drawing insight from multiple sources of patient safety information. Our existing National Reporting and Learning System (NRLS) is uniquely able to detect themes, patterns and issues that are not recognised locally but require national action. A new Patient Safety Incident Management System will replace the current NRLS by 2020. We will use machine learning from incident data, which has the potential to create better insights from the data we collect and introduce a more effective system of Patient Safety Alerts. The Government’s new Medical Examiner system and the Healthcare Safety Investigation Branch should also improve NHS investigation and support implementation of recommendations. Improving patient safety requires people to have the capability and capacity to take action. We will develop a shared and consistent Patient Safety Curriculum that will support current and future NHS staff and patients. We will develop Patient Advocates for Safety to ensure patients are fundamentally involved throughout the system. We will also develop a network of senior Patient Safety Specialists who will be the backbone of patient safety in the NHS. We will build on existing work on preventing patient deterioration including Sepsis and NEWS2 implementation. We will continue our maternal and neonatal safety improvement programme, our work on infection prevention and control and the ‘Stop the Pressure’ programme to prevent pressure ulcers, aligned with the new National Wound Care Strategy. We will design new Medication Safety and Mental Health Safety Improvement Programmes. We will work on falls and fracture prevention, where we know that a 50% improvement in the delivery of evidence-based care could deliver £100 million in savings. NHS Resolution reported total provisions for all indemnity schemes of £77 billion at the end of 2017/18. We will also continue to use elements of the Clinical Negligence Scheme for Trusts to drive improvements in care, building on the success of the maternity incentive scheme delivered in 2017/18. The NHS Counter Fraud Authority will continue to tackle patient, contractor, payroll, or procurement fraud. These initiatives include large scale patient eligibility checking services, managed by NHS Business Services Authority.